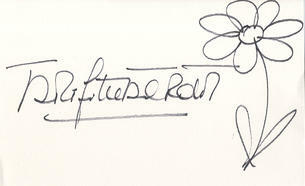 This is a superb Hand Signed large white card 8" x 5" by the legendary French actress. Brigitte Anne-Marie Bardot born 28 September 1934) is a French former actress, animal rights activist, fashion model, and singer. In her early life Bardot was an aspiring ballet dancer. She started her acting career in 1952 and after appearing in 16 films became world-famous due to her role in the controversial film And God Created Woman. During her career in show business Bardot starred in 48 films, performed in numerous musical shows, and recorded 80 songs. After her retirement from the entertainment industry in 1973, Bardot established herself as an animal rights activist.